Kiriath Jearim occupies the hill in the center. Behind it is the Israeli Arab village of Abu Gosh, and the hill to the right is occupied by Moshav Yad HaShmonah. Today’s Highway 1 passes near the site, as did a major route in ancient times. This route was the way the Danites traveled when they migrated from their territory on the coast to the north. They camped near Kiriath Jearim at “Mahane Dan” (camp of Dan). 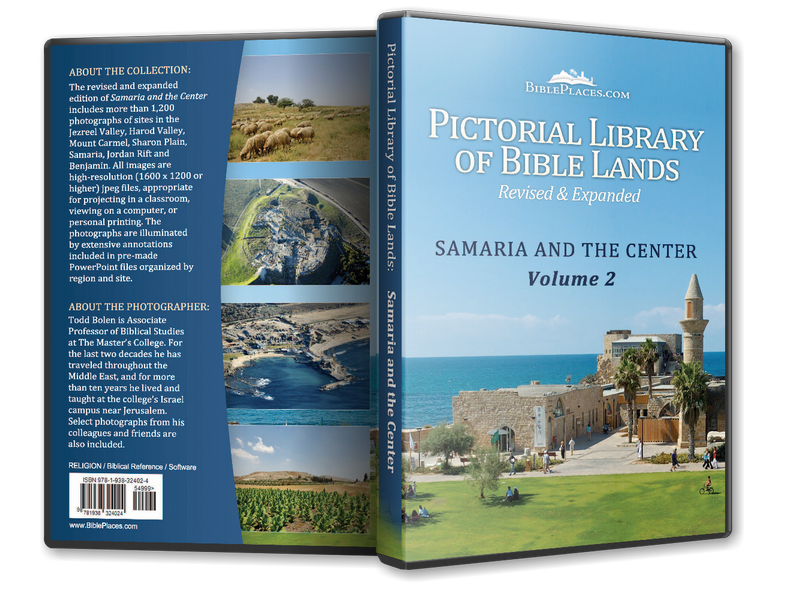 The biblical city of Kiriath Jearim is best known for the house of Abinadab which held the Ark of the Covenant from the time of Samuel until the time of David (about 120 years). 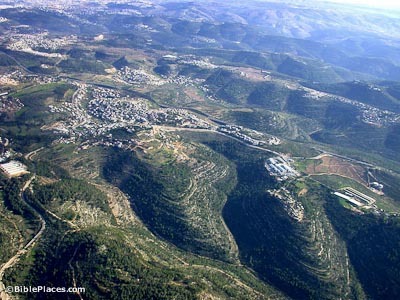 Kiriath Jearim was originally a Gibeonite city that fell within the tribal territory of Judah near the borders of Benjamin and Dan. The prophet Uriah, a contemporary of Jeremiah, was from Kiriath Jearim. In 1905, a farmer was plowing on the summit and found a semi-circular wall with mosaics and other objects. Excavations revealed a Byzantine church from the 5th century. Items that have been preserved include monolithic columns of an atrium, column bases, capitals, and mosaics. 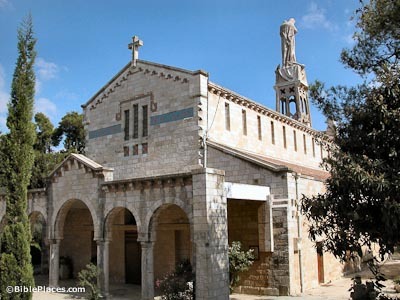 Our Lady of the Ark of the Covenant Church was built over the 5th century Byzantine basilica by Sister Josephine Rumebe in 1911. The statue of Mary standing on the Ark of the Covenant was designed to be visible throughout the area. 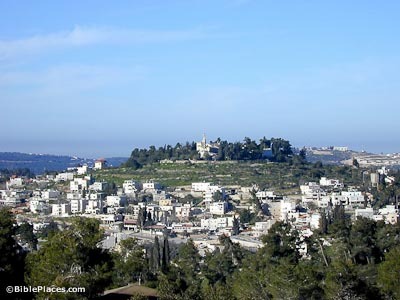 The name Kiriath Jearim means “city of forests.” The modern Arabic name of Kiriath Jearim is Deir el-Azar, which may preserve the name of Eleazar son of Abinadab who was consecrated to guard the ark of the covenant. Kiriath Jearim was probably the site of Baal shrines and cult practices, as indicated by its previous names: Kiriathbaal (Josh 15:60, 18:14); Baal, Bada, Bala (Josh 15:9, 11); Baalath (1 Ki 9:18, 2 Chr 8:6); Baale-Judah (2 Sam 6:2). The Romans had an outpost at Kiriath Jearim along the road from Jerusalem to Antipatris. 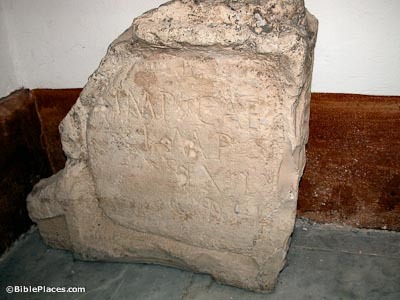 Inscriptions in Latin have been found in the area.